As the leaves change colors and fall off their branches, your roof can quickly become covered in debris. While the autumn leaves are beautiful here in the Ozarks, they can cause various problems for your roof. Now is the perfect time for some seasonal autumn roof maintenance! Follow these tips to keep your roof in top shape for the upcoming winter season. Don’t leave fallen leaves and other debris to rot on your roof or in your gutters. These materials can hold water against your roofing surface, which can lead to rot, water damage, and even leaking. 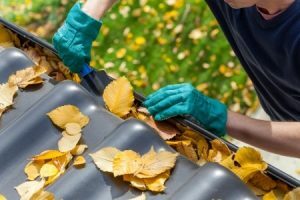 Remove leaves, acorns, twigs, and other debris from your roof and gutters. Most of this can be done from a ladder. You can use a leaf blower or rake to gently and carefully reach far-away debris. Be careful not to tear up your shingles! In preparation for the cold, it’s smart to check your roof and insulation. Climb into the attic and check for damp insulation. Watch for leaks, signs of damage, and other problems from the inside as well as the outside. If you notice any problems in the attic, you may need to climb up on your roof to find the source of the issue. You can do a quick visual inspection from the ground by walking around your house. Look at the siding, soffit, and fascia for signs of rot, wear and tear, damage, and other issues. If it’s rained recently, you should also check the ground around your home to make sure the gutters are draining properly. Next, you can climb up on your roof or use a ladder to look for damaged shingles, soft spots, or other problems. If you encounter any problems during your inspection, call a professional roofer to check out your roof and make repairs. Prepare your home for the wet, cold winter today! Call your local roofing experts at Thompson Roofing & Siding at (573) 789-8367 for autumn roof maintenance in Lake Ozark, MO. Posted in Uncategorized on October 5, 2016 at 4:02 pm by Thompson Roofing & Reconstruction.